Posted November 30, 2018 by The Rapid & filed under Places to Go. With December comes chilly weather and holiday cheer. Don’t let this month of festivities go to waste. 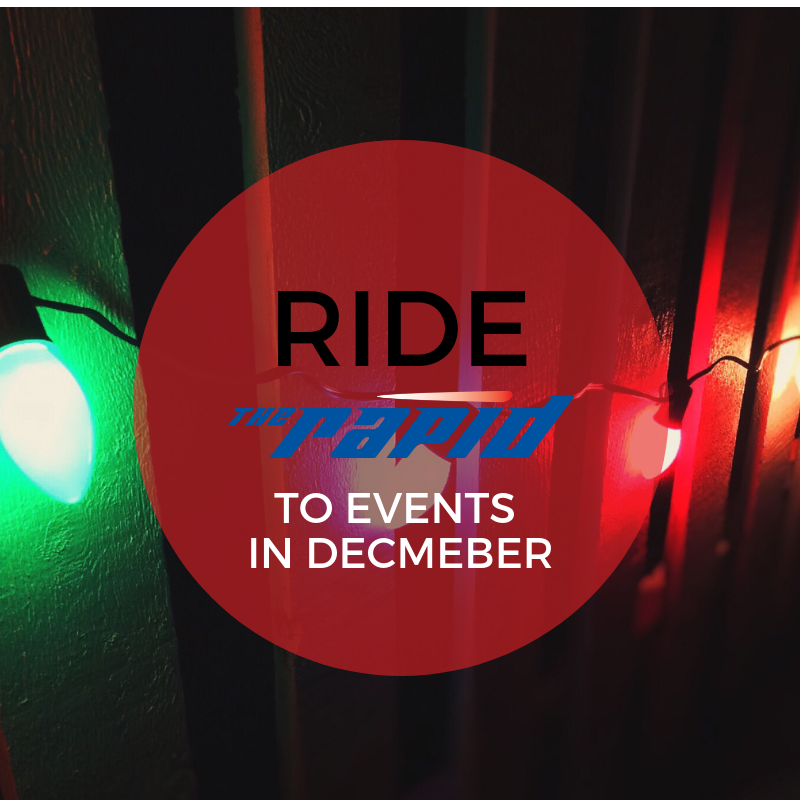 Catch a ride on The Rapid to one of these December events. Create a new tradition this year. The Gerald R. Ford Museum is hosting the Light Up Downtown event. Watch as Downtown Grand Rapids is illuminated with lights and holiday cheer. The event is on Dec. 1 at 5 p.m. and features a variety of free activities and fun for the whole family. Get more details to plan your trip here. Looking for a unique gift this season? You’ll find just what you’re searching for at this eclectic pop-up shop. Located at the Wealthy Street Theatre, the event is on Dec. 1 and goes from 10 a.m. to 4 p.m. Want to RSVP? Click here for the official event page. Have you ever been to the Steelcase Town Hall? Now is the perfect time! They are hosting the annual Holiday Artists Market. Find a great gift for that special someone on Dec. 1 from 10 a.m. to 5 p.m.
One of the most popular events is back again! You can visit the best of Uptown shops, boutiques and restaurants during this evening of fun! This is the perfect transit-friendly event. Mark your calendar for Dec. 6 from 4 – 10 p.m. Need more details? Head to the official Facebook event here. Dance into the season of giving with an evening of pure magic. The Grand Rapids Ballet presents The Nutcracker at DeVos Performance Hall with live music from Grand Rapids Symphony. This is a holiday classic you don’t want to miss. You can find full dates and tickets here. Is there anything more magical than a snowy night illuminated by holiday lights? You can enjoy the annual tree lighting ceremony hosted at the Kentwood Library. The event also includes a holiday light parade (awesome, right?) Show up on Dec. 7 at 5 p.m. Click here for more details on their event page. Find out if you’re on Santa’s naughty or nice list this year. Catch a ride to Woodland Mall every day through Dec. 24 to meet Santa, and most importantly, get your photo taken! The event goes from 10 a.m. – 1 p.m. and you can register here. The Downtown Market is hosting visits from Mr. Claus on Dec. 14. You can take your own photographs, and receive a candy treat. The best part? This event is completely free! Just show up and enjoy. You can find more information here. The GRAM is hosting a unique event this year on Dec. 20 from 5 – 9 p.m. Take one of the exclusive flashlight tours and see the art in a completely new way! For more information go to their site here. Tis’ the season for family-friendly fun. Enjoy holiday classics from the famous organist Lance Luce. Head over to the Grand Rapids Public Museum to attend the show. You can catch the performances at 7 p.m. on Friday, Dec. 21 and at 2 p.m. Saturday, Dec. 22. Get tickets here. Ride The Rapid for a convenient way to get to these events. Plan your trip here.